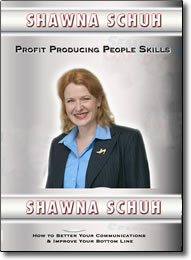 Profitable People Skills DVD by Shawna Schuh – Free Video Clip – Save! In today’s highly competitive world, it’s all about being better than the competition. Doing things they’re not willing to do, and treating the customer in ways that are not typical. In this program on Profit Producing People Skills, you’ll discover practical techniques and easy to implement strategies for bettering your communications in all of the critical areas. Shawna Schuh covers voice mail, e-mail, thank you notes, face to face communications and a number of other subtopics, all related to creating happier, healthier interactions. You’ll be more equipped than ever to build and maintain long-term relationships in your personal and your professional life.